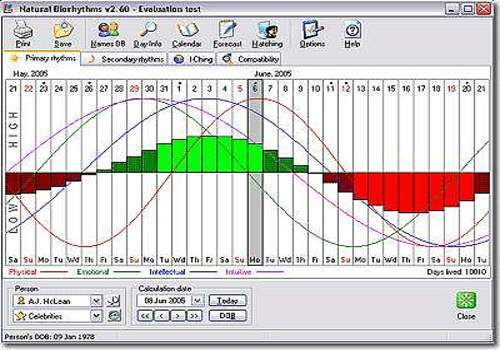 Advanced biorhythms calculator. Knowing your biorhythms, you can be sure about what to expect from each day in order to succeed at business, or in sports, exams or job interviews, negotiating or dating. Be a winner in any situation! Loads of features, including: 10 kinds of rhythms; compatibility test, relationship advices, celebrities database, biorhythmic matching, printable calendar, personal forecast etc.